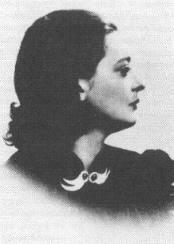 Yesterday was the 100th anniversary of Joy Davidman’s birth. Joy was the inimitable wife of C.S. Lewis. It was a privilege to speak on Joy for the Inklings Fellowship Retreat held at Montreat College in Montreat, North Carolina. The Fellowship is organized by two prodigious scholars: Dr. Harry (Hal) Poe of Union University and Dr. Don King of Montreat College. Both Poe and King have published extensively on the Inklings. In 1922, a young Oxford scholar named C.S. Lewis scribbled some verses to a narrative poem that he would later title “Dymer.” The poetic reinvention of “Dymer” was based upon a prose version originally written in 1916 (when Lewis was a mere eighteen years old) called “The Redemption of Ask.” The poetic version, which was published in 1925, chronicles the odyssey of a young man out of the territory of his youth and into a dense forest where he meets a mysterious and enchanting woman. “He entered into a void. No seam of light Showed through. It was a world not made for seeing. He moved. The floor was soft beneath his feet. After having an intimate encounter with his enigmatic lover (marked by a sensation he calls “holy and unholy”), she disappears and Dymer, over the next several cantos, searches for her. Eventually, he is killed by his own offspring, a product of that evening together, and becomes a god. Let us now go forward several decades. Lewis’s final book of fiction, and one he considered his best work, is published as Till We Have Faces. In this exceptional retelling of the Cupid and Psyche romance, Lewis narrates the story from the perspective of Psyche’s sister, the queen Orual. Psyche informs Orual that the god Cupid has fallen in love with her, and that he comes to her under cover of night. Here we find the same scenario, but two very different characters experiencing the same “holy” coupling. In the first, a male operating on adrenaline and hormones, has a complicated encounter with a mysterious female. In the second, the female encounters a secretive male who is her husband. Before Orual’s insistence on discovering his identity, Psyche is comfortable leaving his face in darkness. Dymer becomes a god, while Orual eventually forfeits her selfish appetite for power to the one true God. 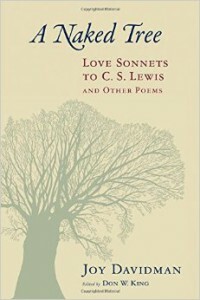 Dymer reflects an earlier version of Lewis, a version contaminated by the “Christina Dreams,” in which fantasies corrupt real love and companionship. Till We Have Faces not only illustrates Lewis’s talent of narrating outside gender, but also illuminates the importance of humility in revealing our true motivations and intentions. So what significant force provided such a shift in tone? Joy served as the “midwife” for Till We Have Faces. In fact, the book is dedicated to her, as the creative collaborator behind the book. Lewis nurtured the idea of retelling the romance for many years, and with Joy’s encouragement and assistance, Lewis was able to complete it. So who is this mysterious woman, who emerged from the dense “forests” of New York to alter the life and works of confirmed bachelor C.S. Lewis? Essentially, she was a divorced ex-communist ex-patriot poet. Sounds like a great match for England’s beloved children’s author and most famous lay theologian, yes? 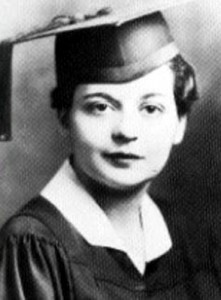 But Joy Davidman was much more than that. In the past, certain scholars have accused Joy of exploiting Lewis, of being “gold digger,” only marrying Lewis for the financial stability while he financed the educations of her two sons, with writer Bill Gresham. Some feel that the clandestine civil marriage between Lewis and Davidman, completed simply for extending his British citizenship so Davidman would not be deported, was an attempt to steal his fame or tarnish his reputation. More often, she is framed as the literary death knell, removing him from the company of his Inkling friends, while absorbing his time and attention. And all this from the woman whose death inspired the richly written lamentation known as A Grief Observed, in which Lewis calls her his mistress and muse. As Lyle Dorsett writes in his work chronicling Joy’s life, And God Came In, Joy came of age in the turbulence of New York City in the 1920s. Her mother Jeanette descended from affluent Jewish merchants who had abandoned their home in the Ukraine, migrating like thousands of others to the “promised land” of America. Jeanette, essentially, was historically Jewish. However, her husband Joseph Davidman was an atheist who restrained his untraditional views to ensure peace in his household; Dorsett identifies it as a “tepid indifference” to Judaism. As educators and voracious readers, Joy’s parents fostered an appetite for knowledge into Joy and her younger brother Howard. During the summer, it was not uncommon for Joy and Howard to visit the library nearly every day, although her parents maintained an impressive library in their home. Among the works that Davidman read was George MacDonald’s Phantasies. However, Joy’s early life was extremely difficult. Her father was cantankerous and overbearing. 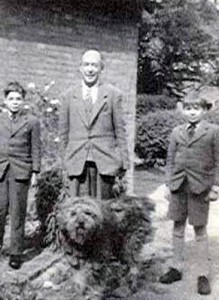 Some family members recall Joseph blowing a whistle to summon his children “in the fashion of trained dogs”. Joy, forever the doting daughter, attempted to win her father’s affection. A bright, receptive student, Joy excelled in academics. Although she suffered from a crooked spine, Graves Disease and hyperthyroidism, which contributed to excessive school absences, her grades were largely unaffected. She was soon recognized as a poet with the publication of her poem “Resurrection” (a poem shaped by religious themes, although Joy described it as a “private argument with Jesus”). In addition to a demanding father and nagging illnesses, Joy and her brother Howard endured the “demons of anti-Semitism” which plagued them nearly everywhere they went, even when they travelled throughout the United States on holidays and vacations. Joy eventually matriculated to Hunter’s College, a tuition-free women’s college located in the Bronx. Joy thrived there; she quickly found her youthful love of books had matured into an abiding love of literature and language. Joy was already “proficient” in German and Latin, learned French in college, and taught herself Greek in her spare time. She also began crucial friendships with other students of the literary persuasion, including novelist Bel Kaufman. While at Hunter’s, Joy served as associate editor of the literary magazine Echo while participating in the English club and Sigma Tau Delta, the national English studies honorary society. Joy published a story in Echo titled “Apostate” in which a young Jewish woman elopes with a Christian to avoid an arranged marriage to a “weak man”. The woman is baptized into the Christian faith so she may wed, but the wedding is disrupted by her family who violently beat her as her “husband” looks on and the pastor escapes. The story won the Bernard Cohen Short Story Prize that year. After graduation, she obtained employment as an English teacher at Walton High School. She also decided to pursue a Master’s degree in English at Columbia University. Her towering academic achievements were unfortunately overshadowed by major cultural shifts. The Great Depression ravaged the overcrowded, unemployed residents of New York. Some predicted a slow, yet steady pace of national rehabilitation, but the hopelessness, for some, was too much to bear. One afternoon before her graduation in 1934, Joy watched in horror as a young woman on an adjoining building plunged to her death. The girl had leapt to her demise after struggling unsuccessfully with depression and hunger. Joy interpreted this as a byproduct of the growing capitalistic society upon which many staked the precarious recovery of the American economy. Although Joy had never experienced the pangs of hunger and poverty, she felt a deep compassion stirring for those less fortunate. Dorsett writes that “…her anger grew increasingly at the insanity and callousness of a society that dumped potatoes in the ocean, burned wheat, and poured lime on oranges, while millions of people were unemployed, malnourished, and forced to stand in soup lines and sort through refuse in garbage cans for sustenance” (21). These images, coupled with her increasing animosity toward greedy corporations, eventually led Joy to join the Communist party. Joy resigned from her teaching position in 1937 to devote more time to writing. Earlier, in 1936, some of Joy’s poems were published in Poetry magazine. This connection would eventually lead her to a friendship with celebrated novelist and poet Stephen Vincent Benet. Benet headed the Younger Poet Series for Yale University Press. When Joy submitted nearly fifty poems for the competition, she won and found a quick admirer in Benet. These works were published by Yale University Press as Letters to a Comrade in 1938. The following year, Joy won the Russell Loines Award for Poetry, a prestigious award that she shared with Robert Frost. During this time, at the behest of Benet, Joy spent time at the MacDowell Colony in Peterborough, New Hampshire. This colony utilized the concept of collaboration and encouragement among writers and artists to produce and refine good art. It served as an artistic catalyst as well as a retreat from the tumultuous society surrounding them. Much like the Romantics of the nineteenth century, these artists sought repose and restoration through nature as anodynes for the treacherous stranglehold of modern life. Former members of MacDowell include author Willa Cather and poet Sara Teasdale. If writers and artists were selected for the colony, they were expected to pay their own expenses, although impoverished ones could still attend with the assistance of philanthropic donations provided by wealthy businessmen and politicians such as Andrew Carnegie, J.P. Morgan and President Grover Cleveland. Ironically, Joy used her time at MacDowell to rail against the evils of capitalism (although she was not a sworn Communist yet) while some of her associates attended only through the generous sponsorship of corporations! MacDowell Colony proved to be artistically beneficial for Joy. She published a novel, Anya, in 1938. A second novel, Weeping Bay, followed later in 1950. Joy soon became a sworn communist and spent much creative energy contributing to the communist publication New Masses; she also worked a stint in Hollywood writing scripts. 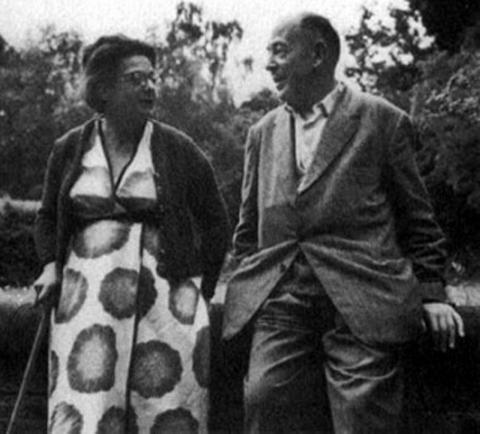 Joy eventually met and married fellow writer William (Bill) Lindsay Gresham. By nightfall there was nothing left to do but wait and see if he turned up, alive or dead. I put the babies to sleep and waited. For the first time in my life I felt helpless; for the first time my pride was forced to admit that I was not, after all, “the master of my own fate” and “the captain of my soul”. All my defenses – the walls of arrogance and cocksureness and self-love behind which I hid from God – went down momentarily. And God came in. – From Out of My Bone: The Letters of Joy Davidman (Ed. Don W. King). “I went back to C.S. Lewis and learned from him, slowly, how I had gone wrong. Without his works, I wonder if I and many others might not still be infants “crying in the night’” (95). The experience influenced her next novel, Weeping Bay. Although Joy was ecstatic over the spiritual changes occurring within her, it did little to repair her marriage. Bill was still drinking and began to dapple in Buddhism while Joy was exploring and practicing orthodox Christianity. In August 1952, she sailed to England “to consult one of the clearest thinkers of our time for help”. She stayed with a friend, Phyllis Williams, while in London and arranged to meet Lewis in Oxford at the Eastgate Hotel. The visit was a rousing good time. Warnie loved Joy - her quick wit, her boundless sense of humor, her keen intellect. Joy returned to stay at The Kilns during Christmas. The Lewis men immensely enjoyed Joy’s visit. Joy and Lewis discussed her upcoming book Smoke on the Mountain. That Christmas, Lewis gave Joy a copy of George MacDonald’s Diary of an Old Soul with an initial inscription from George MacDonald, followed by “Later: from C.S. Lewis to Joy Davidman, Christmas 1952″. Joy had a rapturous time at The Kilns, but the tone changed significantly when a letter arrived from Bill. Joy’s cousin Renee was looking after her sons during her voyage and English holiday. Bill admitted that he had fallen in love with Renee and recommended that he and Joy file for divorce. Distressed and confused, Joy asked Lewis for guidance; Lewis ultimately agreed with Bill and suggested a divorce. In late November, Joy moved, with her sons in tow, to England. Her marriage was dissolving but Joy was happy to be “a transplant”. She struggled to provide for her family, as Bill’s child support checks were insufficient and often unpredictable. She maintained her friendship with Lewis, even later obtaining a residence in Headington, near The Kilns. Lewis would visit “every day” with many visits lasting “until eleven at night”. Despite this propensity for brutal honesty, it was obvious that Joy was passionately in love and that Lewis was developing mutual feelings for her. Joy composed love sonnets, most likely written in 1952 during her initial visit to England. According to the poems, Lewis at first rebuffs Joy’s advances by claiming that he preferred blondes. Perhaps it was the humor of an old bachelor, but Joy is deeply distraught by this dismissal. The theme emerges in several of the sonnets. As many now know, thanks to the romantic yet hyperbolic film Shadowlands, Joy’s residential permit was not renewed by the British Home Office. To extend his British citizenship, Lewis generously married Joy in a civil ceremony on April 23, 1956. Lewis kept the affair quiet, fearing criticism and disapproval from his colleagues and friends. Joy was then diagnosed with cancer (originating from radium treatments for her thyroid condition when she was young). She began evasive cancer treatments. The illness proved to be a turning point for Lewis; he realized that he truly did love Joy. Furthermore, he wanted to seal a commitment before God. There were married at her hospital bedside on March 21, 1957. After this, Joy experienced a period of brief but wonderful convalescence. They honeymooned in Wales and Ireland. Later they spent twelve glorious days in Greece with Roger and June Green. Although viewed as coy and intangible to Joy at first, Lewis finally warmed to Joy and a beautiful romance blossomed. Joy writes in a letter dated February 28, 1957: “All I really care about is having a bit of life with Jack and getting adequately on my feet for it. He has been growing more attached to me steadily – is now, I think, even more madly in love with me that I with him, which is saying plenty – and give dear Georgie Sentman my love and tell him he was wrong about the intellectual Englishman’s supposed coldness. The truth about these blokes is that they are like H-bombs; it takes something like an ordinary atom bomb to start them off, but when they’re started – Whee! See the pretty fireworks! He is mucho hombre, my Jack!” (308-309) Joy quickly transformed The Kilns from a bachelor pad complete with ash burns on the carpet and black-out drapes to a habitable abode. 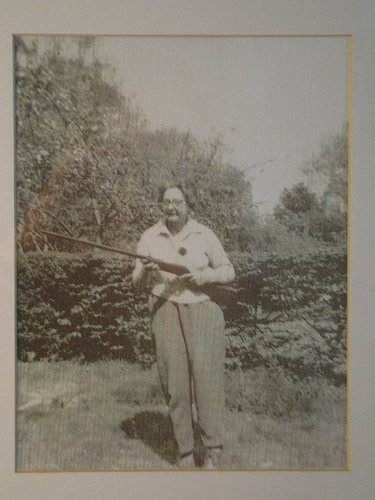 Not only did Joy busy herself with redecorating, she also engaged in home security measures by brandishing a shotgun. Perhaps Lewis admitted that he was not a pacifist, but he certainly was a reluctant marksman. Lewis was opposed to using weapons in threatening trespassers, yet Joy proudly purchased a shotgun to protect the property. Douglas Gresham tells us in Lenten Lands that on one occasion when stubborn poachers refused to leave, Joy retrieved her gun immediately. Lewis stepped in front of her to offer protection (as any chivalrous man would do), to which Joy emphatically yelled, “Damn it Jack, get out of my line of fire!” (85). As Lewis illuminates, Joy’s influence is undeniable. Joy, along with other female friends such as Dorothy Sayers, Ruth Pitter, and Sister Penelope, assisted Lewis is realigning his perspective on females and feminine depictions. Notice in earlier Lewis works how women are generally characterized. As we have seen in “Dymer,” she is the mysterious temptress who gives birth to a beast. In Lewis’s first post-conversion work A Pilgrim’s Regress she is both the temptress of the “brown girl” but also “Wisdom” personified. Many have argued that this illustrates Lewis’s strong dislike for women, framing them as “Eves” or intangible ideals. However, if we investigate testimonies of the women Lewis actually corresponded with, we find a very different portrayal. We see a distinct change progressing through the space trilogy (composed in the late 30s and 40s). There is a more nuanced, more complex portrait of women, from the “Green Lady” who is full of love and light in Perelandra, to the stubborn Jane Studdock and the ladies of St. Anne’s and extending to Miss “Fairy” Hardcastle, head of the N.I.C.E. Institutional Police. Later we see major shifts illustrated in each installment of The Chronicles of Narnia. Lucy, the girl with indomitable faith who leads the group through the Wardrobe to Narnia and later through unfamiliar terrain in Prince Caspian, Susan the queen who eventually get tangled up in the modern day world and forgets about Narnia. Then there is the headstrong protagonist from The Horse and His Boy Aravis, the careful and caring friend to Digory, Polly Plummer from The Magician’s Nephew, and the courageous Jill in The Silver Chair. Lewis provides the reader with a wide variation of female characters. This progression correlates, if unintentionally, with his growing correspondence with women. The later installments of Narnia, as well as Till We Have Faces, illustrate the collaborative benefits of Joy’s expertise. 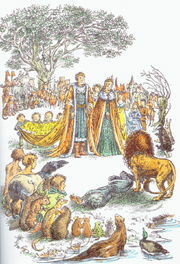 One very notable character from The Magician’s Nephew is Helen, the cabbie’s wife who becomes the first queen of Narnia. Helen is Joy’s name, and this is a sign of her ultimate creative influence as she is incorporated into the fabric of the Narnia stories. 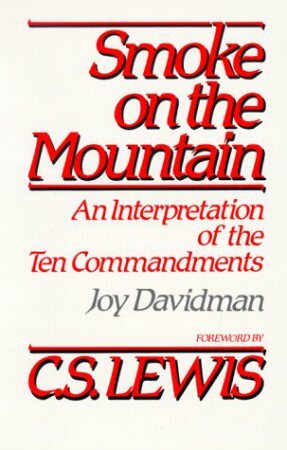 It is also noteworthy to mention that Lewis influenced Joy’s writings as well. Their marriage was one of creative reciprocity. In addition to Smoke on the Mountain, Joy was working on a book concerning “The Seven Deadly Virtues” and thanks to Warnie’s encouragement, a book on Madame do Maintenon. 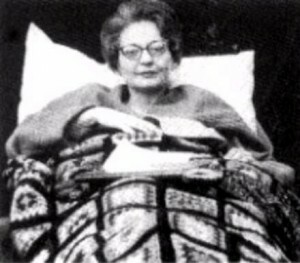 She writes on February 19, 1954… “Warnie keeps suggesting that I collaborate with him on a life of Madame do Maintenon, Louis XIV’s morganatic wife. She’s never been done, and she’s fascinating – a noblewoman born in the workhouse, spending a mysterious girlhood in the West Indies, coming back and marrying a paralyzed poet and wit, later becoming the governess of the king’s illegitimate children and catching the king! She was interested in education for women, founded a girls’ school, and used to pop out of the kind’s bed at dawn to go and get the little ones up and take a few classes herself. Wow!” (179-180). Unfortunately, this book, as well as the book on the Seven Virtues, was never published, with drafts and notes currently housed at the Wade Center in Wheaton, Illinois. Joy has been portrayed as a communist seducer, a comfortable commuter of coat-tails, and one prominent scholar even referenced her as a “gold digger.” But the literature proves that Joy was none of these. Lewis financially assisted Joy, but letters show that she reluctantly accepted the help, and often with much remorse. Many scholars support their arguments by expressing the sentiments of Lewis’s friends, J.R.R. Tolkien among them, who was suspicious of the union. Perhaps the origin of such irritation for many of Lewis’s friends was that Joy was a rather progressive (some might even say feminist) voice for her time. Much like Lewis’s mother Flora Lewis, Joy was an unconventional female. She was a celebrated poet, as Lewis desired to be. She challenged him and simultaneously inspired him to think in new and diverse ways, which is reflected in the depth of his later work. Her marriage to Lewis was treated with the utmost respect. Joy knew the substantial risk but emotional nourishment that marriage can deliver. She viewed marriage through the lens of Christ and yet with the shrewd consciousness of a modern woman. So now, let us revisit the first images we evoked, not of a disillusioned Dymer traipsing through peculiar territory, but of a two spouses, one a mortal, one a god, tucked away in a strange and wonderful palace. Of a love expressed, despite uncertainty, in what Charles Williams would deem and Lewis and Joy would concur as a “holy” union, where God is glimpsed in the joining of two souls. Where perhaps, we can understand God more clearly by loving one of his creatures, and by loving, improve ourselves. This is what marriage was for C.S. 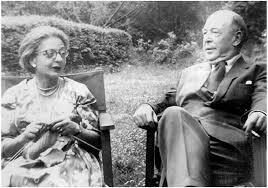 Lewis and Joy Davidman. It was intellectual admiration, then an abiding fondness, and finally a spiritual convergence. And after death has ravaged the body, has torn lovers from their embrace, and the widower commenced his mourning, what then? Then there is renewal. Then “like cast off clothes” she has left but only to “resume” them bathed in a different, but equally wonderful kind of holiness. Joy writes in what is considered one of her most moving verses, “Yet One More Spring” that there is perennial value in her death. Under the wind, under the stooping sky? Only the tongue of leaves forever and ever? Bitterly the bright color of blood forever. After my death to kiss you forever and ever. This morning, we can answer this question. What will come of you Joy Davidman Lewis? Joy will be rightly recognized as a profound poet, as a creative collaborative, an erudite editor, and most importantly as a beloved daughter of God, whose writings gently remind us that love is a gift and that faith, in eternity and in mankind, is a flame never extinguished.